Derangers, I think it’s time we resurrect Raiders of the Lost Archives. And there are a few ways to do this. We could take one of the original scripts and update it; archives have changed just a little bit since the ‘80s. We could write an entirely new script, in the style of the old ones. Or we could do something completely different, taking RotLA as our inspiration. SAA is open to the idea, but we need to submit it as part of the education session proposal process, which ends on September 30th. That gives us just about 2 weeks to get this going. And I need your help! Can you write? We need to write a proposal, to get this thing off the ground, and then write scenes and songs. Can you act, sing, direct, or play music? We need people to perform this thing. Can you tell us about the good old days? 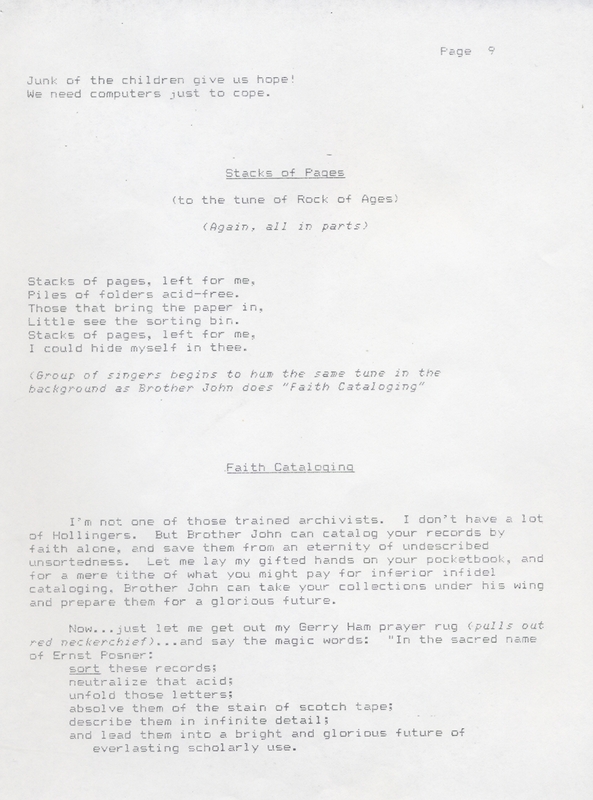 We need people who participated in the original Raiders of the Lost Archives, as performers, writers, or audience members, to help us remain true to the spirit of the original. Can you herd cats? We need a few people to help organize this thing, and to put their names on the proposal. If you’re interested in helping out with this project–even if you’re not sure about going to SAA14–please join this Google group. If you have ideas, you can also comment here.